Bouncing a check in Nevada can be serious. Intentionally writing a bad check is even more serious. It does not take much for a bad check to become a felony offense, something you want to avoid at all cost. How does one commit this crime? The use of property; or Credit extended by any licensed gaming establishment, drawn upon a bank account when the person has insufficient money to pay in full. This basically means you knew you did not have enough money and wrote a bad check to pay for something. Intent that the person who wrote the bad check to defraud can be presumed if the check was written on an account that does not exist, payment is refused by the drawee, unless within 5 days after receiving notice of fact from the drawee or holder, the drawer pays the holder of the instrument in full plus any handling charges, or notice of refusal of payment sent to the drawer by registered mail at an address printed on the instrument is returned because of non delivery. If you write a bad check in the amount of $650 or more, or write multiple checks in a 90-day period that amount to $650 or more you will be charged with a category D felony. This carries a minimum 1-year in prison to a maximum 4-years in prison, a fine up to $5000 and restitution. If the amount is under $650 you will be charged with a misdemeanor, up to 6 months in jail, a fine of up to $1000 and restitution. Most people find out that if they wrote a bad check when they learn they have a warrant for their arrest. This can be active for years. If this is the case our office can help you resolve this and in most circumstances without having to go to jail and stay in custody. If you are summoned then our office can appear before the court, and begin to defend you and work for a dismissal. 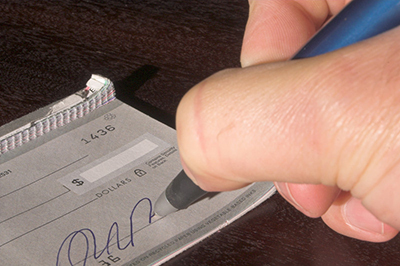 Don’t delay or ignore a bad check. If you are charged with writing a bad check contact our firm so we can fight for you and try to get the best possible outcome. Call us today for a free consultation.